Just recently, I took a break and watched “The Return of the King” on video. At the same time, I was pondering a topic for this article. As often happens, the themes and timing converged. Here are 10 things you can learn about marketing your small business from the Lord of the Rings trilogy. 1. The task is primarily yours. In the Lord of the Rings, Frodo must complete the task that is primarily his (i.e. to destroy the ring at Mount Doom). In the same vein, marketing your business is a job that is primarily yours. If you don’t take the time or make the effort no one else can do it in your stead. 2. You will benefit from help. Throughout Frodo’s journey he was supported and assisted by many people along the way. 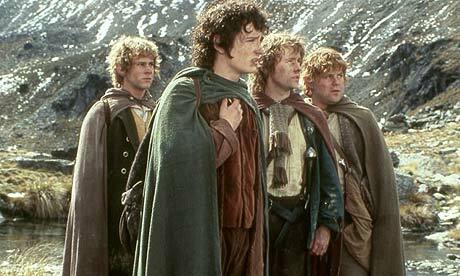 Sam, Merry, Pippin and other friends and allies helped Frodo accomplish his goals. Many entrepreneurs generally avoid asking for help. Who or what do you need to ask for help so that you can be more successful than you are now? 3. The path always opened up and not usually before it was needed. In the movie, there were many times Frodo and his company narrowly escaped doom and destruction. At the last minute a path would open up that would lead them to safety. In marketing your business it’s often the same way. You can see where you need to go but the path may not open up for you until the last possible moment. You need to stay the course and trust that all is unfolding just perfectly – even when it doesn’t look that way in any particular moment. During the movie, there were many times Frodo wondered, “Why me?” and several times where he was too tired to think about going ahead but he did, led on by his vision and sense of responsibility. Where in your business can you be more persistent and more responsible to your vision? How could this give you the energy to move ahead? 5. Pay attention to signs along the way. Throughout the movie, there were hints and clues about what might happen next – the same is true for your business. When you pay attention to the clues and hints along the way you are more well-prepared for any unexpected turn of events. Pay particular attention, especially, to outcomes which are significantly different than you anticipated. 6. Take advantage of the rest-stops. It’s important on a hero’s quest, and as a small business owner, to take periodic rest-stops in order to refresh and refuel. When you find yourself in a business lull use that time to put additional structures and supports in place. Use the rest-stops to your greatest advantage. 7. Recognize that everything comes together in due time. Sometimes, small business owners feel impatient when their business is not growing as fast or profitably as expected. Understand, though, that building a business has a certain rhythm and pattern. When you work within the pattern, rather than fighting against it, you will feel calmer and more confident. For Frodo, he needed to travel a great distance to get to Mount Doom and he needed to ‘put in his time’ so to speak in order to complete the quest. For example, he had to first travel to meet Galadriel or else he wouldn’t have been able to move through the part of the journey when he met with Shelob. So understand that all your efforts are coming together even if, sometimes, they seem like random tangents to your path. 8. Learn as much as you can along the way. In the movie, Frodo learned about various lands by paying attention to those people he met along the way. He was able to gain assistance and loyalty because he took the time to learn from everyone he met. The most successful business owners are the ones who continually make time to learn and take the best of what they learn to propel them even further. 9. Be flexible and yet stay the course. Several times in the movie, Frodo needed to change his plans in order to appropriately respond to events as they unfolded. Similarly, small business owners need to be flexible in their planning so they can take advantage of new opportunities as they arise. 10. Success may sometimes look or feel different than you expected. In the movie, each of the main characters pursued a different path after the journey was finished. Each had a different life trajectory after playing their part in the story. For every small business owner success may look different than you expected and may require some new adjustments. For example, you might have great success with a marketing approach and then have some glitches in fulfilling the orders. Success doesn’t come without lasting change. finally, where can celebrate your success and move onto a new playing field?